The earliest known mention of the name “Atlantic” for the world’s second-largest ocean was in Ancient Greece. The Greeks called said ocean “the Sea of Atlas” or “Atlantis thalassa”. In the Hindu tradition, the god known as Vishnu has seven different avatars i.e. incarnations or manifestations. Rama is the seventh of these avatars. The Nike slogan “Just Do It” was created in an advertising meeting in 1988. Apparently the phrase was inspired by the last words of famed criminal Gary Gilmore. Gilmore faced execution by the state of Utah in 1977 and when asked if he had any last words he simply replied, “Let’s do it”. A few minutes later, Gilmore was executed by a firing squad. Brass is an alloy of copper and zinc. Compare this with bronze, an alloy of copper and tin. Brass and bronze are often mistaken for each other. “Solitary Man” is a 1966 song written and recorded by Neil Diamond that was his debut single. Diamond tells us that he himself is the “solitary man” in the song. I saw Neil Diamond in concert back in the mid-nineties, and I must say he does put on a great show. His voice is cracking a bit, but that didn’t seem to spoil anyone’s enjoyment. I’ve also seen Diamond interviewed a few times on television, and I wouldn’t say he has the most scintillating of personalities. A ranchero is someone who owns, operates or is employed on a ranch. The term “ranchero” has Spanish roots. Robert F. Kennedy was the seventh child of Joe and Rose Kennedy. “Bobby” served as Attorney General in the administration of his elder brother, President John F. Kennedy. The younger Kennedy suffered the same fate as his brother, and died from an assassin’s bullet. He was shot in 1968 during his campaign for the Democratic nomination for the US presidency. He was assassinated by a young Palestinian named Sirhan Sirhan, apparently in retaliation for supporting Israel after the Six-Day War of 1967. A collection of geese is referred to as a “gaggle” when on the ground. When geese are in V-formation in flight, they are referred to collectively as a “skein”. In French, an “île” (island) is “terre dans la mer” (land in the sea). A tenor (plural “tenori”) is a male voice that falls between that of a countertenor and a baritone. The word “tenor” comes from the Latin “tenere” meaning “to hold”. This etymology refers to the tenor part that carried the sustained melody (canto fermo) of a traditional polyphonic composition. The name of our fluid measure called a “gallon” ultimately comes from the Medieval Latin term “galleta” meaning “bucket, pail”. Tuscany is a beautiful region in central Italy, the capital of which is the city of Florence. Tuscany is considered to be the birthplace of the Italian Renaissance, which was centered around Florence. It was home to great artistic icons such as Dante, Botticelli, Michelangelo, da Vinci, Galileo and Puccini. The title “signora” is used in Italy for a married woman. It is the equivalent of “Mrs.” in English. Jan Steen was a painter from the Netherlands who was active in the Dutch Golden Age, the 17th century. Steen’s most famous work is probably “The Feast of Saint Nicholas”, which we can see at the Rijksmuseum in Amsterdam. Rory McIlroy is a very successful golfer from Northern Ireland. McIlroy is a relatively young man and a former world number one on the circuit, so folks can’t help but compare him to Tiger Woods. He is first European to win three different majors. Along with Jack Nicklaus and Tiger Woods, McIlroy is one of the only three people to win three majors before the age of 25. The giant multinational called “HP” (originally “Hewlett-Packard”) was founded in 1939 with an investment of $538 in a one-car garage in Palo Alto, California by Bill Hewlett and Dave Packard. The company name would have been Packard-Hewlett, if Dave Packard had won a coin toss! Phencyclidine is a recreational drug usually referred to on the street as “PCP” or “angel dust”. Lagos is a port and the biggest city in Nigeria. Lagos used to be the country’s capital, until it was replaced in that role in 1991 by Abuja, a city built for just for this purpose. Lagos is also the most populous city in the whole of Africa (followed by Cairo in Egypt). Cannoli (singular “connolo”) are Italian sweet pastries that originated in Sicily. Cannoli are made by filling tubes of fried pastry dough with a creamy filling that usually contains ricotta cheese. “Cannolo” is Italian for “little tube”. Berlin is the capital of Germany. It is the nation’s largest city, and is the second-most populous city in the European Union (after London). “Fodder”, meaning “animal feed”, is an Old English word for “food”. Edvard Grieg is Norway’s best known composer, some who was active in the Romantic Era. Grieg’s most famous works are the gorgeous “Piano Concerto in A minor”, and his incidental music for the play “Peer Gynt” by Henrik Ibsen. “Der Spiegel” is a very successful German magazine found on newsstands all over Europe. The name “Der Spiegel” translates from German into “the Mirror”. 26 Fireworks reaction : OOH! 48 “Not likely!” : AS IF! Kudos to all. Jack, you are doing so good! 52A: NFL sudden death OTs are set for 15 minutes, not 10. @Jack, I (obviously) missed that change. Thanks for setting things straight. I had a good time with this Monday morning, easy puzzle. Yes ! There is a god …… btw, there are many Hindu gods with bows ( and arrows…) … Rama is probably the most prominent … and the only four letter one … Arjun in the MahaBharat is supposedly the greatest archer … but that is the ‘other’ epic story … and he is at best, a Demi-god. How do you clean brass ? That has tarnished with some sort of patina ? I had a bunch of small momentos that I cleaned yesterday .. all brass … I boiled them in household vinegar, with a spoonful of salt and a spoonful of citric acid – got them as good as new !!!!?!!!! Didn’t notice the theme. Need to learn to spell SANAA. Never heard of OBO. What I did like were 5 Italian words and 2 German words. I will never be done in 15 minutes. Couldn’t even write the answers over in that short of time. Took exception to the 40A clue. The clef denotes a pitch range or perhaps suggests an instrument but does not denote a specific pitch. That would be the function of a NOTE (on a staff). From my college dictionary: Clef, noun … a symbol written at the beginning of a musical staff to indicate the pitch of the notes: there are three clefs: G (treble), F (bass), and C (alto or tenor). LAT: 7:02, no errors. Difficult for a Monday. WSJ: 5:49, no errors. More like it. Got the meta, too. Newsday: 6:03, no errors. CHE: 8:30, no errors. BEQ and New Yorker for later as I’m running pretty late getting around to these. New Yorker: 1:02:05, 5 errors between 11D and 38A. Never have witnessed 38A. Ever. BEQ: 53:38, no errors. 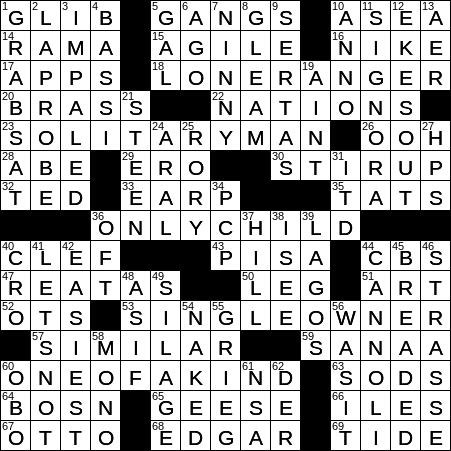 Overall, hate all the Northeast-centric cluing endemic to these puzzles. 8:43. Monday puzzle but there were a few answers I didn’t know off the top of my head. Dave, I CAN’T believe the venerable (snobby) New Yorker had February spelled wrong! That’s kinda hilarious. The best copy error I ever saw was in an issue of Vanity Fair from a few years ago: they actually misspelled the word “malapropism,” of all things — they left out the second “a”!! 😁 I wish to heck I had kept that issue.